This portrait is one of the most beautiful examples of the great actress María Guerrero’s (1867-1928) lifelong obsession with her own image. She began having her portrait painted by the most famous painters of her time while still an infant. 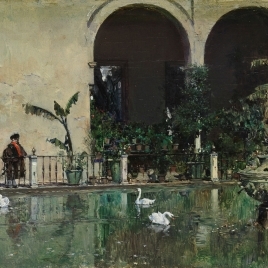 This fixation was favored by her father’s friendship with many of those artists, and as a result, the Museo del Prado has several splendid likeness of her besides this one, including Emilio Sala’s 1878 portrait of the actress at the age of 10 (P4188) or the much later one by Joaquín Sorolla (P4647). 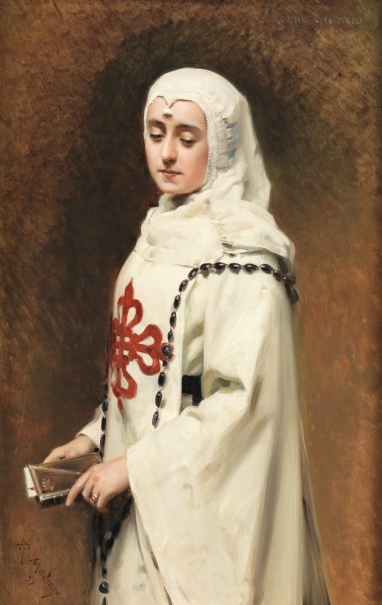 Here, Raimundo de Madrazo presents her wearing a Calatravan nun’s habit for the role of Doña Inés from José Zorilla’s Don Juan Tenorio. This was one of María Guerrero’s must successful and acclaimed roles. She appears at the age of twenty-five in front of an ocher background that brings out the whiteness of her habit. Looking down, she holds a prayer book in her hands, and a large rosary with jet beads hangs over her shoulders. Born in Madrid on April 17, 1867, María Guerrero studied with distinguished actress Teodora Lamadrid. In her youth, she shared the stage with great Spanish actors Emilio Mario and Ricardo Calvo, as well as French thespians Coquelin and Sarah Bernhardt. 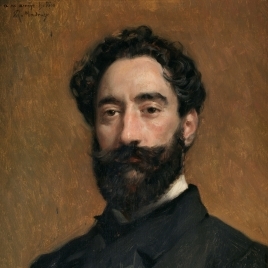 In 1896, she married aristocrat and also actor, Fernando Díaz de Mendoza (1862-1930), with whom she formed a theater company. Together, they were largely responsible for one of Spanish theater’s most glorious periods, premiering close to 150 works over the course of their career, not only in Spain, but also in Latin America. One of María Guerrero’s greatest triumphs took place at the Teatro de la Princesa in Madrid, and after her death on February 28, 1928, it came to be known as the Teatro María Guerrero, as it still is today. 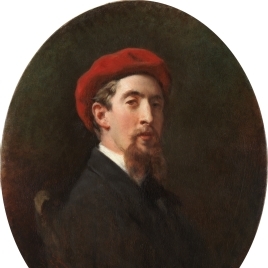 In this splendid canvas, Raimundo de Madrazo again reveals his exceptional capacity for portraiture, to which he dedicated a considerable part of his oeuvre, as well as his capacity to capture, with all the sensitivity of his brushes, the submissive and innocent sweetness that characterize the figure of Doña Inés in Zorilla’s immortal work. Here, María Guerrero masterfully transmits these qualities in her pose, concentrating all her expressiveness in the smoothness of her large, downturned eyelids. Her figure is enveloped in the elegant and idealized halo that Madrazo brought to his female images, reflecting his adoption of the practices of French portraiture. And yet, due to the model’s identity and the character she represents, this portrait also reflects the pictorial tradition of Spain’s Siglo de Oro, both in its palette and in the rich and vibrant light captured by the paint. Thus, the actress is bathed in a glow that comes from above, bringing out her figure against a background that is barely suggested by rapid patches of color applied with wide, energetic brushstrokes and a very diluted paint that allows the priming to show through in places. 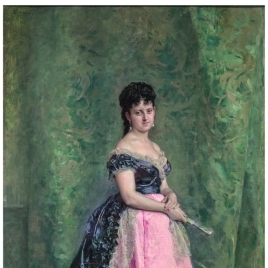 This brings a particular freshness to the work’s highly modern execution, both in the actress’s face and in the summary approach to her habit and the background (Text drawn from Díez, J. L.: El siglo XIX en el Prado. 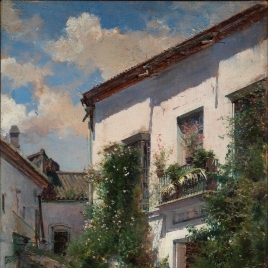 Museo Nacional del Prado, 2007, pp. 332-334). Height: 115.5 cm. ; Width: 74 cm. El mundo literario en la pintura del siglo XIX del Museo del Prado, Centro Nacional de Exposiciones y Promoción Artística, Madrid, 1994, pp. 216,217. Tres mitos españoles: La Celestina, Don Quijote, Don Juan, Sociedad Estatal de Conmemoracines Culturales, Madrid, 2004. Díez, José Luis; Barón, Javier (ed. 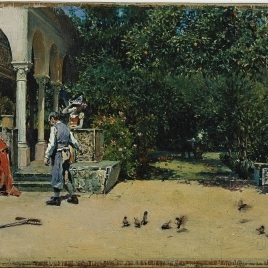 ), El siglo XIX en el Prado, Museo Nacional del Prado, Madrid, 2007, pp. 332/ lám.76. 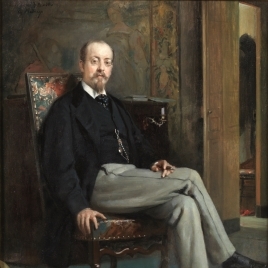 Museo Nacional del Prado, Pintura del Siglo XIX en el Museo del Prado: catálogo general. Dirección científica, José Luis Díez; catálogo, Ana Gutiérrez Márquez; coordinación, Pedro J. Martínez Plaza, Museo Nacional del Prado, Madrid, 2015, pp. 359-360.